Grand Lodge of Prince Edward Island A.F.& A.M. This website was designed to provide information to our membership and also provide an opportunity for those who are not members to visit and see what Freemasonry is about. This site also provides links to other Masonic Concordant bodies. Freemasonry is the oldest and largest fraternity in the world. It is a fraternity of men who desire to make their lives better and to do what is right in the world. While Freemasonry is not a religion, it is religious in that it encourages all its members to be faithful and true to their religious beliefs. Freemasonry encourages all Masons to respect all religions and has three guiding principles – Faith, Hope and Charity. My theme for this year is “Be The Example”. I have carefully chosen this theme as I very strongly believe this can very positively serve our entire Fraternity. Act as though everyone has you under close scrutiny, knows that you are a Freemason and is observing your every action and attending closely to your every utterance. In so doing, if you keep the tenets of Freemasonry: Brotherly Love, Relief and Truth as your guidance, you will achieve two results. First and foremost, you will be acting in such a superlative manner that you cannot help but improve yourself, which is one of, if not the main goal in Freemasonry. Additionally, all who observe you will or should be very favourably impressed, thus elevating our beloved Fraternity to everyone you encounter. This would be akin to having a huge sign on your vehicle and driving with due consideration for other users of the road. I am not advocating that you all should put Masonic symbols on your vehicle, but merely to act as if everyone you encounter on the road knows you are a Mason. Now take that analogy apply it to your every day character and I believe my theme – “Be The Example” will assist each and everyone of us who follows it to become a better person and that everyone we meet will have a very high opinion of our Craft. As your Grand Master for this year I would hope you would treat others as you would like to be treated. Please, be the example, and benefit the multitude, your Fraternity and yourself. Grand Lodge of Prince Edward Island, A.F. & A.M.
MW Bro R. Gordon Carter was born on April 17, 1946 to his parents Robert and Annie (MacLennan) Carter and raised on the home family farm in North Milton, PEI. His father was a Master Master, raised on December 19, 1944 in St. John’s Lodge No. 1, Charlottetown and passed away October 1956. Gordon bought the home family farm in 1969 where he ran a mixed farm and commenced a hog, grain and soybean operation in 1979. Over the years, he also had a custom service operation and a snow removal business. Bro Carter was raised in Prince of Wales Lodge No. 18, Wheatley River on April 1, 1980 and installed as Worshipful Master of his lodge in 1990. 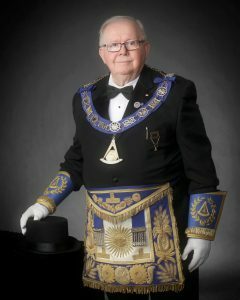 Gordon was appointed as a Grand Lodge officer in 2011 and subsequently served in the Grand Lodge of Prince Edward Island to date. Past involvements include: a number of years on Church Council, past Member of Voluntary Resource Council, Member and Past President of Local 104 National Farmers Union (NFU), past Regional Coordinator and National Board Member of NFU, Co-chair National Farmers Union Farm Crisis Committee on PEI, Member of National Livestock Committee NFU, past Boy Scout Leader (West Royalty), and six years on the Board of Directors of PEI Grain Elevators. MW Bro Carter has been married to his wife Mary (Boswall) since 1970. They have two sons – Paul and his wife Angelie; Robert and his wife Jacqueline and granddaughers Lauren and Olivia. His son Robert was raised on April 10, 2008 in Grand River Lodge No. 151, Waterloo, Ontario and has just completed two years as Worshipful Master of his Lodge. Bro Gordon is both proud and humbled to serve as the Grand Master of the Grand Lodge of Prince Edward Island; he was installed as Most Worshipful Grand Master on June 9, 2018 at the 143rd Annual Communication in Summerside, PEI.